Journey into the elegant cool-climate world of Australia. See how high altitude wine regions and ocean proximity, combined with evolving winemaking practices and attitudes, have influenced the wines being crafted in Oz. At the upcoming Vancouver International Wine Festival, the ‘Oceans, Altitudes and Attitudes’ trade seminar is the ideal way to get the skinny on trends in Austrlalia viticulture in 90 action-packed minutes. My WineAlign colleague, Australian-born Rhys Pender MW and I will moderate our way around the country, as we taste wines that embody our triple themes of ocean, elevation and new perspectives. There is much on the move down under. History, evolution and revolution have shaped this sun-baked land’s wine industry in a profound way. Australian wines reach so far beyond their stereotyped soft-and-generous fruit style: nowadays there are raspy light reds, bladerunner whites and crisply sharp bubbles that will utterly shred your preconceptions about Australia being just a hot place to grow grapes. Truth is these wine styles have always quietly existed, but changes in the vinescape, vineyard sites and attitudinal shifts have made these cooler-grown wines much more of the norm. The Vigneron: One of the most important attitude shifts that’s really taken hold across the country is the fusing of grapegrowing and wine making roles. Phil Reedman MW, a respected Adelaide-based industry consultant sees this as a key qualitative change, he told me when we were tasting in the Barossa last week. Nowadays, big and small wineries are adopting the French notion of the vigneron…. where the farming of grapes and the making of wine are indivisible. The rough translation of vigneron is ‘winegrower’ and this notion that importantly connects the vineyard and the winery has permeated philosophies of big and small producers. Abel Gibson, from the tiny, wonderful winery Ruggabellus is a grower/winemaker who fashions miniscule amounts of truly exciting wine in the variable terrain of Barossa. He has planted a vineyard high in the breezy hills and is babying vines through their infancy with the same singlemindedness that he lavishes on the barrels of wines that bubble away and then relax in old casks at his tiny home/winery. On a completely different scale, Sue Hodder, chief winemaker at Wynns Coonawarra Estate, also embodies this shift, and she is every bit as involved and intimate with her much more substantial vineyard land. It shows in each bottle and tier at Wynns, where every flavour and structural element is always absolutely in the right place, and wines have an effortless balance and poise. When to pick: Attitudes about picking times constitute an important shift according to the great winemaker Phil Laffer, who has seen the country flourish during 30 vintages at Lindeman’s and 20 years steering Jacob’s Creek. He’s seen Australia shift from fortified to table wines and been an instrumental part of the astonishingly successful charge to export markets. Picking dates are now as much as 4 to 6 weeks earlier in some regions. Picking raisined grapes and making high alcohol wines in the past was simply cheaper; less grape spirit was needed to boost them to 20% alcohol or more, and flavours were not so important. Now, almost obsessive care is taken in picking for flavour, balance and freshness. Brave New Grapes: Jeremy Oliver, author of Australia’s Wine Annual, points to changing views of the grape scape, and increasing interest in Mediterranean varieties, especially Italian reds like sangiovese, barbera and nebbiolo. He states that though there is still much to learn (and vineyards need to mature), a few regional associations are emerging, like sangiovese with McLaren Vale, the King Valley and Heathcote; nebbiolo with the Adelaide Hills, McLaren Vale and Heathcote; barbera with the King Valley, the Lower Hunter Valley and Mudgee. Tempranillo is showing well in sites from Clare to McLaren Vale to Victoria, and best of all chardonnay seems to be finding a true comfort place of balance all over the country, where acids are less screeching, fruit is more chiselled and confidently forward, oak is far more judiciously used. Good thing too, give that there are over 25,000 hectares of it planted. Orange is the Cool: In the last few decades, Australians have begun to scale the hills, planting at unheard of heights and teasing wonderful freshness and natural acidity from grapes. What’s the point of elevation? In a nutshell, lower temperatures mean slower, even ripening for forward fruit flavours, without a shred of raisiny over-ripeness, lighter tannins and precise acids. Sunlight is different as well, giving greater light intensity without heat units. Orange is a classic example. Located in the Tablelands of New South Wales, it’s a few hours’ drive from Sydney. A true cool-climate region defined by the high altitudes within the Shires of Orange City, and defined by an elevation boundary as well as a geographic footprint. To use the GI, vineyards must be above 600 metres above sea level (lower reaches use the Central Ranges appellation). While most plantings are young, dating only back to the 1980’s, there are over 1,500 hectares planted already, indicating the interest in this cool growing region. Vineyards climb from 600 metres to over 1,100. The temperature change is significant for a vine: at 650 metres the average January temperature is 21.5 º C, but at 950 metres it drops to 18.5 º C at the height of the growing season. Grape harvest is delayed by 1 week for every 100 metre rise in elevation. Whites like sauvignon blanc and chardonnay are a natural fit in Orange, as are aromatics like riesling and pinot gris, but light and juicy shiraz wines (often styled with a drop of viognier) are captivating too. Pinot noir may have a future, but plantings are small still. It’s important that altitude is matched to grape variety – thicker-skinned cab and shiraz can struggle to ripen at 1000 metres, and do well a little lower, whereas you can dial in chardonnay at any height and create peachy to lemony fruited beauties. Philip Shaw, famed winemaker at Lindemans, Rosemount and Southcorp, became fascinated with Orange and planted vines in 1989, giving Cumulus winery its start. He believes that merlot is a perfect variety for Orange, but there are still just 200 hectares, compared to shiraz’s 400 hectares. Prized Fruit for Sharpening Blends: Tumbarumba is another region to watch. Half way between Sydney and Melbourne, and just a 3 hour whiz from Canberra, the air and water are mountain-pure. With 1180 growing degree days and an average maximum temperature of 18.3 º C, it enjoyed a stellar reputation as a grapegrowing region (rather than a winemaking one) since the 1980’s when premium wine grapes were planted at altitudes of 300 metres to over 850. A quick troll through the Tumbarumba Vignerons Association shows that this cool-grown prized fruit goes into top wines from Penfolds, Treasury to McWilliams and Clonakilla. Next time you are enjoying Penfolds magnificent Yattarna chardonnay, you’ll taste a little bit of Tumbarumba’s cool environment. 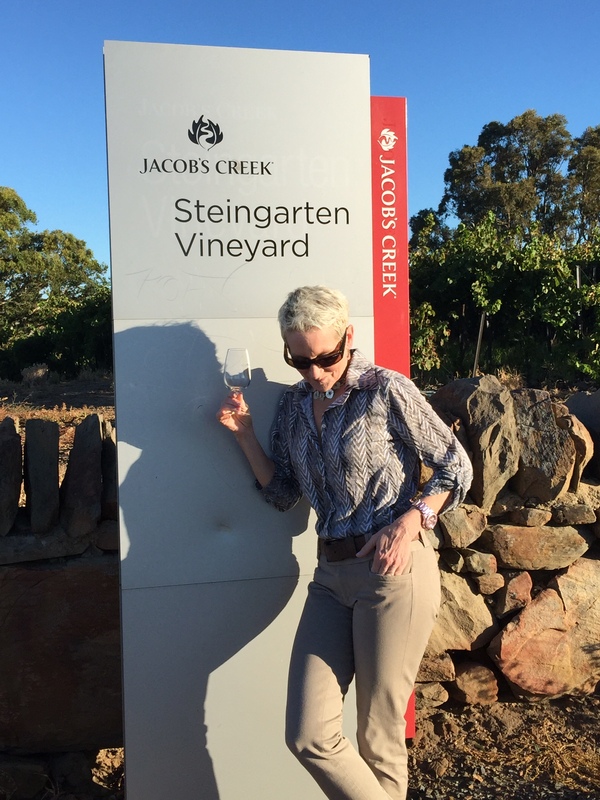 Sublime Steingarten: Also high and cool is Eden Valley’s Steingarten Vineyard, a remarkable hilltop site that just sits on the Eden/Barossa boundary. At about 450 metres of elevation it’s not the highest vineyard in Eden (Pewsey Vale is higher) but it is venerable and yields intense, nervy fruit riesling fruit that hums and crackles with electricity. Jacob’s Creek chief winemaker Bernard Hicken describes the unique and site-specific features of Steingarten (only 450 cases worth of fruit comes from this low-yielding vineyard) as far from the Barossa Valley norm. There is a 2-3 ºC degree temperature difference from valley floor to the vineyard, as well as a notable diurnal shift of 12-15 ºC. 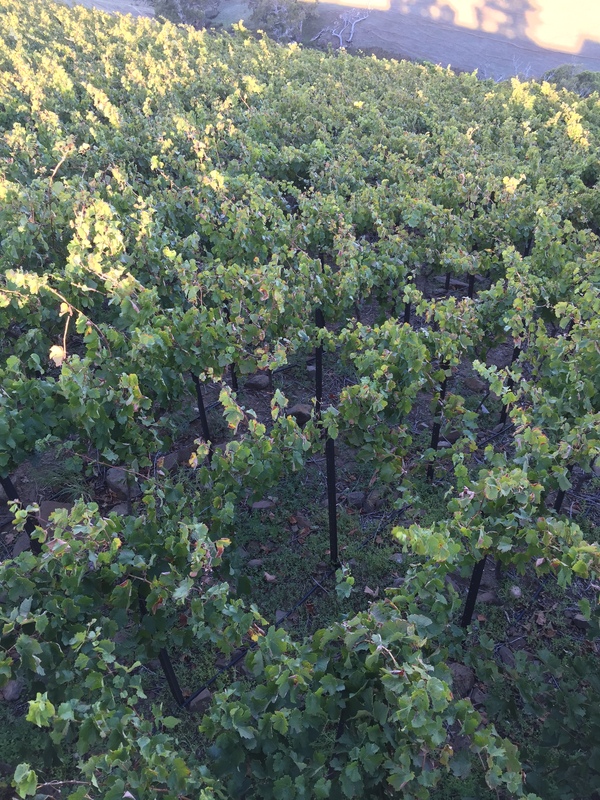 Vintage is felt sharply here, with picking times varying by 2-3 weeks year by year. Global warming has had an effect too, as picking dates have advanced 3-4 weeks over the last 20-30 years. The 30 degree slope looks truly Germanic, and its sharp incline attracts downdrafting cold winds, known as katabatic or gully winds, cooling Steingarten further in the late afternoon and early evening. Visiting in early February was a chilly experience, but you immediately understand the piercing acidity that helps this stately riesling age for decades. The vine’s spindly trunks belie their 53 years – they have been stressed by dense planting, wind abuse and meagre exposure to morning sun only. This vineyard is a poster-child for cool-climate if ever there was one. 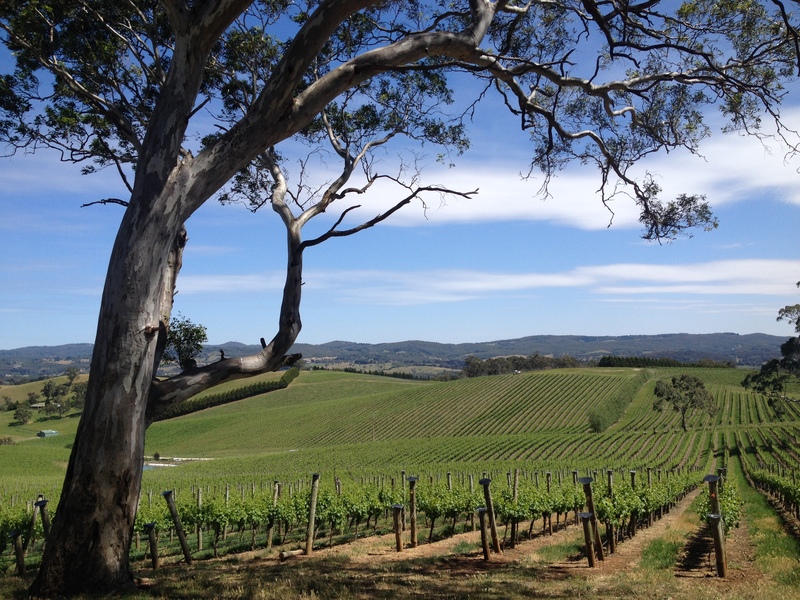 Chill in Adelaide: Just to the south of Barossa, the Adelaide Hills are as hot as a tin shed roof these days. ‘Hot’ as in ultra-cool and fashionable, where wines of finesse and varietal intensity have been turning heads for years now. It’s a very large wine region, but with small, undulating and often steep hills, marked by cool nights and growing degree days as low as 1172. Mount Lofty’s summit is 710 meters, but much of the vineyards lie at well over 400 meters, and many of Australia’s elite vignerons work or source fruit from this distinctive area. The sub-region of Picadilly Valley is 1-2 ºC cooler still that Steingarten vineyard in the Eden Valley. Taste the Wolf Blass Gold Label Chardonnay 2013, and its riveting acidity and vivid lemony fruit offers a good insight into the potential of the Adelaide Hills. The Sunburned Country: For sun-deprived Canadian wine lovers fixated on our deeply romanticized images of Oz (Christmas at the beach, shrimp-on-the-barbie every day, it never, ever snows!) it can be hard to imagine how Australian wine might have anything whatsoever to do with the concept of ‘cool climate’, even though ‘cool’ is now the coolest thing an Aussie wine can be. So, maybe it is surprising to learn that of the more than 60 fine-wine regions of Australia, 24 are ‘true cool-climate’ and as cool, or cooler, than Bordeaux, famous for its moderate maritime climate. After all Australia is an island, and that one of the oceans surrounding it (the Great Southern) is a notorious source of nasty winds. Three wine regions that are blessed with a maritime climate beneficial for winegrowing are Margaret River in Western Australia, the Mornington Peninsula in Victoria, and the island state of Tasmania (read Treve’s Travels Part I & Part II for details on these regions and their wines). In all of them climate is moderated by close proximity to large bodies of water, with cooling ocean winds creating a longer growing season that makes possible fresher, more elegant wines with an ideal balance between fruit and acid. To put ‘cool’ in relative perspective, it is instructive to refer to the Heat Summation system, developed at UC Davis, whereby cumulative ‘degree days’ for a wine region are calculated (using a slightly tricky formula) totaling the number of degrees above 10°C (50°F) during the 7 month growing season. There are five classifications: Region 1 (<1390) is ‘very cool’; Region 2 is ‘cool’ (1391-1670), and so on. Using this system, growing degree days (GDD) ratings for Champagne and Burgundy are 1031 and 1164 respectively; Bordeaux 1392, and Napa 1499. In comparison, Northern Tasmania’s GDD rating is 1020, Margaret River is 1690, and Mornington ranges from 1080 – 1570. For comparison, Penticton in the Okanagan Valley is 1320. Mighty Margaret River: If the GDD of 1690 for Margaret River looks on the high side here, it is important to note that the Margaret River region is literally surrounded by water. While temperatures inland can be stinking hot, Margaret River temperatures are modified by a legendary wind from the south called the ‘Freemantle Doctor’ that brings cool air from the ocean, creating the moderate growing conditions to produce the famously elegant wines of Australian icons Leeuwin, Cullen, and Vasse Felix. Without the ocean effect, the wines would be very different. Dr. Thomas Cullity of Vasse Felix planted the first vines in Margaret River in 1967, in red gravel in redgum country, with clay about 18” below the surface; in 1972 he bottled Margaret River’s first cabernet sauvignon. As any visitor to Melbourne soon learns, bracingly cool (ok, bloody cold) breezes can scream in from the Southern Ocean at any time; it is safe to say that there is a distinctly ocean-affected climate. The Mornington Peninsula south of the city has become renowned as a cool-climate wine region, with a global reputation for pinot noir – a grape once deemed ‘impossible to grow’ in Australia. By virtue of being cool, Tazzie has become one of Australia’s hottest regions. Launceston at the north end of the island is not just cool: at 1020 GDD’s it is flat out super-cool. Here the ocean breezes from the Bass Strait are at least as important in winter as in summer – keeping the temperatures up and protecting the vines from frosts. This is sparkling country. ~ All critics’ shared their top 20 Under $20 at the VIWF, and will chime in on their top 3 wines to taste at the festival in our joint BC Critics’ Report early next week. Finally, Anthony Gismondi’s Final Blend column will take a look at tasting notes, critics and where the WineAlign team is tasting, travelling and focusing.